Now that I have some me time I’m ready to get back to quilting. This is the first thing I would like to get finished and I’m stumped and would really appreciate some quilting suggestions. Keep in mind, I’m certainly not that advanced with my longarm, though I have mastered edge to edge pantos and freehand meandering. This is a 120 x 120 king size quilt that will have Hobbs wool batting and it’s all batiks including the back. WOW That is beautiful. I can't help you, but I'm really interested in hearing what others have to say. Gorgeous quilt! Someone else will have to pop in with quilting suggestions though. Your quilt is beautiful....pattern and colors! I don't have any suggestions as I'm learing to FM quilt myself and haven't mastered anything. MHO and only MHO is that when I see a quilt that is very busy in the piecing I prefer the quilting to be more subtle-let the quilt be the show-off....like I said -- MHO! Which do YOU prefer-lots of quilting or not? My own preference is that if the piecing is minimal then I'd like the quilting to stand out a bit more...but if the piecing is prominent then I'd like the quilting to be more subtle to show off the piecing. Good luck with your choice...wish I could have been more helpful! Beautiful quilt and love your fabrics. I don't have any suggestions on quilting as I always send my quilts out to a LA quilter but I sure will be checking in to see what everyone suggests. Lisa, welcome back and glad you have some You time! I suggest heading over to MQR (Machine quilters resource). its all machine quilters. Not all long armers and there is a thread on there for help. The subscription is $20 a year and is totally voluntary. The owner used to be a long armer and now keeps the site up for us. Lots of help over there. Sometimes someone will draw a suggestion on your quilt...and sometimes they have quilted one like it and will post how they quilted it. I would suggest some dot to dot quilting in the body of the quilt and some feathers in the border. Or a nice panto in the body and then the feathers. If you are not confident doing feathers freehand you could get or make a stencil and mark them. This is a perfect way to look at the quilting IMHO, too. I know this might sound a bit goofy, but what color thread are you planning for the main body? I like my stitches to stand out, so with the light and dark it is sometimes difficult to choose. For the quilting, I would pick something that has lots of curves, and goes up as far as the border. That wonderful wide border should have something to enhance it. I too think the same way, intricate piecing should shine though and not the quilting, and a simple quilt is the perfect place to showcase a favorite quilt design. I’m still not sure what I will do, either freehand organic non symmetrical wavy lines or a large meander, but leaning more towards the lines. Thank you all for your kind words and feedback. Personally, I think anything but a meandering stitch or a panto would take away from the intricate, beautiful piecing and design of the quilt. Along that line, I have seen and used myself a very large overall floral for backing and quilted it from the back, following the florals. It can be most effective while not distracting from intricate piecing and adding a new dimension to very staid and boring piecing. Because the back's already on this one, I'd suggest my first comment. Check out Baptist Fan. I think it will enhance the flow of the blocks. Stunning! 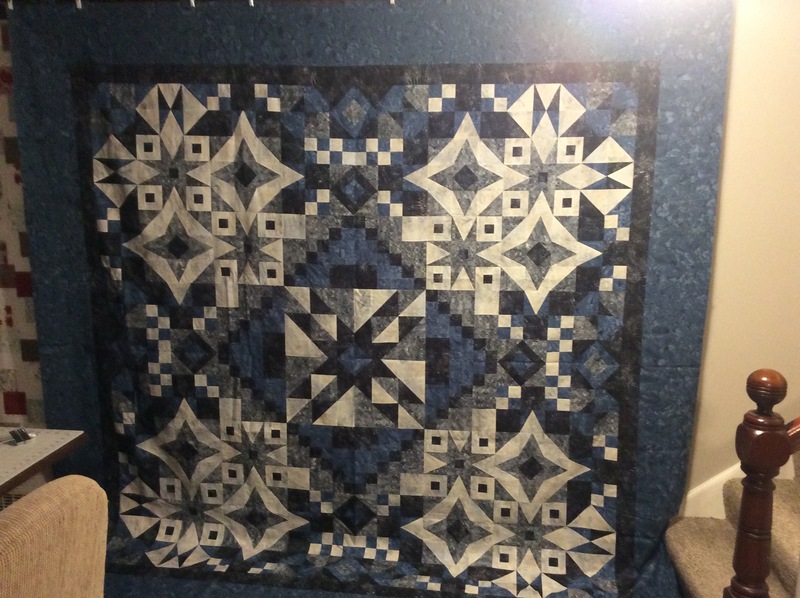 Like so many others I am so impressed with you quilt but have no ideas on how to quilt it! I would like to see the fabric and block design not "interrupted" by the quilting. Beautiful, beautiful quilt. No help with the quilting part; whatever you decide will be beautiful. This is what I would do if it were mine. I would pick a thread that crosses all fabrics in the quilt with as equal an amount on Contrast a possible. For the pattern I would use fairly large swirls or circles. Deb’s circles comes to mind. This is a beautiful quilt with a lot going on. Keeping thread and pattern fairly simple will enable the quilt its self to be the star of the show.